Raul Castro, former Arizona governor, attends an event in Phoenix on Jan. 3, 2011. The 96-year-old former U.S. diplomat was stopped at a Border Patrol checkpoint last week after a radiation detector was set off. A 96-year-old former Arizona governor and former U.S. diplomat says he holds no grudges against the U.S. Border Patrol agents who he says detained him at a checkpoint for more than a half-hour in stifling heat after his pacemaker apparently set off a radiation sensor. Raul H. Castro says although he wasn’t mistreated, agents could have been more sensitive to his age and condition. The Border Patrol says Castro was “delayed” for only 10 minutes and that it “regrets any inconvenience” caused by the stop. Castro was governor of Arizona from 1975-77 before serving as U.S. ambassador to Argentina from 1977-80 under President Jimmy Carter. He was U.S. ambassador to El Salvador from 1964-68 and U.S. ambassador to Bolivia from 1968-69 under Presidents Lyndon Johnson and Richard Nixon. The checkpoint incident happened on June 12. 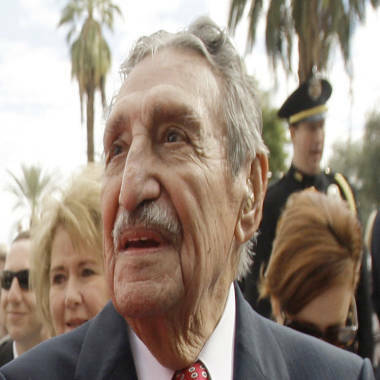 Doan, the daughter of former Nogales, Ariz., Mayor Arthur Doan and a family friend of the Castros, was driving Raul Castro from his home in the border town of Nogales to a luncheon in Tucson, about 70 miles north, to celebrate his 96th birthday. Their car was stopped at a Border Patrol checkpoint on Interstate 19 near Tubac, Ariz., about 24 miles north of the U.S.-Mexico border, after triggering a radiation sensor. Castro had a medical procedure for his heart and pacemaker the day before and he believes that’s what set off the sensor. Doan said an agent directed Castro to a tented area for a secondary inspection, with temperatures approaching triple digits. Doan said she asked the agents if Castro, who was dressed in a suit, could sit in his air-conditioned car instead but agents said he could not and that they had a fan blowing in the tent. “I explained that he was a former governor and ambassador, a true statesman, and that he was 96 years old and that he shouldn’t have to be going through this. They knew it was the medical procedure that was coming up on their radar,” Doan wrote. “It was very hot. It was uncomfortable,” Castro recalled. Doan said agents asked Castro a series of questions, brought out a document for him to sign and then ran a detection machine over his body again before telling him he was free to go. Doan and Castro estimated they were held up for more than 30 minutes. A Border Patrol spokesman declined further comment. Castro didn’t make a big deal the incident but his wife, Patricia, was more critical. “They’re doing their job, which we understand. Ordinarily we pass through there with no problem. But there’s a certain time when somebody’s that old and highly respected; in that state it seems to me they would have given some consideration to that,” she told msnbc.com. Doan said agents could have been more accommodating and sensitive. “They had a job to do and this 96-year-old gentleman was nobody even though he was former governor and former ambassador,” Doan told msnbc.com. Alessandra Soler, executive director of the American Civil Liberties of Arizona, told the Arizona Republic that agents should have used discretion instead of solely relying on a machine to detain Castro. "I think most people would agree that subjecting a 96-year-old man to secondary screening does little to secure our borders and a man who had just informed them that he had undergone this medical procedure," she told the newspaper.